Dear Friends, It gives us great pleasure to inform you that our Company Max Interior Design Pvt. 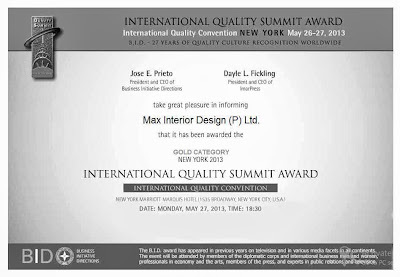 Ltd. is Awarded for the Most Prestigious International Quality Summit Award 2013 in Gold Category by BID — Business Initiative Directions. Thank you all for believing in us and valuable support!